Welcome to another Monday following the second weekend of Haunting Season 2016! This week will be chock full of updates from the haunt that has a special place in our heart here at Westcoaster: the granddaddy of them all, the Halloween Haunt, Knott's Scary Farm. Up first is a look at the new mazes and Skeleton Key Rooms for the year. They are a tremendous offering, and they really demonstrate just how much Knott's has stepped up their maze game over the past several years. Lets check them out! Over the past two years, this "Zombie Laser Tag" attraction has occupied the sprawling layout of Camp Snoopy. But this year, to make room for the debut of The Hollow scare zone, Special Ops: Infected was relocated to behind Mystery Lodge, replacing the Forevermore Maze, and made into a more intimate actual maze. Still retaining its gun battle gimmick, Special Ops: Infected received some nice upgrades with this change in the form of a fully custom layout, theme, and design (which didn't have to make do with Camp Snoopy's terrain), plus a much more efficient cycling process. Mind you, because of the popularity, expect lines to be long still. Especially now that this attraction will not have any ticketing system but will be first-come-first-serve, guests will flock to kill zombies (remember: head shots only). But the flow has been streamlined. Rather than a single leader who guides groups of eight through the entire layout, guests are actually shuttled from one "station" to another. A soldier will brief guests on the situation, then motion them into a scene. Various scenes have additional actors playing soldiers who pace them through, and the beginning of other scenes will have patrolmen to speed up or momentarily halt guests to ensure a more uniform flow. This is a very smart move by the designers, because it enables better overall control of how many people flow through the maze and how frequently. On Friday, which was about a half capacity day, up to a thousand guests an hour went through Infected--a great capacity, especially for this style of attraction. Beyond that, the soldiers pushing (not physically) guests through creates an urgency that is appropriate for this scenario. After all, it doesn't make sense to lolligag through an urban wasteland that's been run through with the walking dead. The intensity of the packed nature creates a great ambiance. In addition, the sets themselves are gorgeous--I truly think this maze could stand on its own without the laser tag feature. The Metro scene in particular was pretty mind-blowing and really shows how much Knott's has upped its standards. Special Ops: Infected is another winner by designer Jon Cooke, and it's highly recommended for all guests this year. Video from previous years' preshow plays as a squad leader explains the mission. The process is much more fast-flowing this year, designed to get people through quickly. Guns ready? Lets go kill some zombies! Entering the first scene, guests immediately find an easter egg in the form of this remnant from the Forevermore maze--which might actually even be in the same place! A city scene in chaos unfolds dramatically. Other maze tie-ins abound too, such as this billboard for the fictional Paranormal Inc. TV series. There's also a signage with the Decayed Brigade Sliders logo that I wasn't able to get a photo of, because of the pace of the maze. Guests are shuttled from room to room, where, of course, the undead attack. It's a great high-adrenaline experience. The intimacy of this version of Infected in maze form helps things too. It creates a more frenetic environment. Party with a zombie clown? This one's not joking around. Onto another urban battlefield scene. The quality of theming is just gorgeous. This downed helicopter thinks it's a shark. I thought this made for a pretty badass shot. From point to point, soldiers are on hand to guide guests onward and direct overall maze flow. This change from previous years makes for a much-improved efficiency. Guests rushing through are immersed in the moment. Onto the metro, where guests have to find the source of contamination that's spreading the infection. Looking back on the scene. See what I mean when I say it could be a regular maze by itself? Time to go into the subway. The detail here and little theming nods were pretty fun. Kind of a blurry shot, but I wanted to include these as evidence of the great ambiance and action. Guests can't help but be drawn into the narrative. I initially thought this was a custom map, but second glance, I guess Calico is actually Washington DC! Still, the details are pretty great. Going through subway cars, with zombies attacking at random. The apocalyptic feel was very strong here. Yup, guests love the experience. 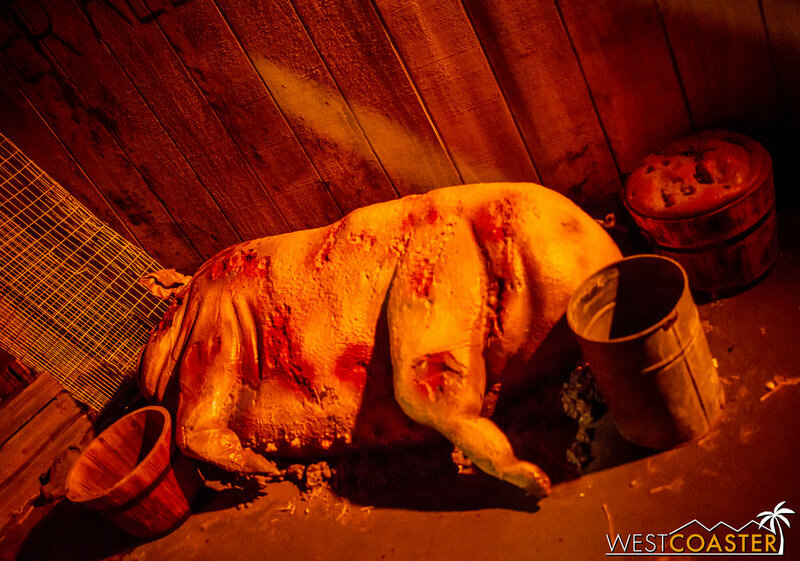 Located in the Wilderness Dance Hall and taking the place of the long-running Pinocchio Unstrung maze from many previous years, The Red Barn is a throwback to your classic blood and guts maze of Haunts past--but with the detail and quality of the latest generation of Scary Farm mazes. This Gus Krueger and Daniel Miller co-creation takes guests into the domain of a redneck cult of killers with an affinity and devotion to animals. It's got a bit of a Texas Chainsaw Massacre inspiration, and it's plenty of blood and guts. Over several trips through across my two Scary Farm visits last Thursday and Friday, I saw a cast that initially started off slow as they adjusted to the environment and advantages of the maze but quickly warmed up to a high energy, multiple scare performance. Because of the traditional theme, this is the type of maze that can be a bit of a letdown if you hit it during a lull in staffing capacity, since it depends on a good amount of pop-out startle scares to be effective. Fortunately, this seems to have been minimal, and most of the lulls were in the beginning, which allowed for a fast paced second half to end on a high note. Plus, the scenery is plenty gory, as would be expected by anything that came from Daniel Miller. There are also moments that require guests to duck down and navigate from a less psychologically comfortable stance. Welcome to a hillbilly hellscape. The Red Barn is full of red lighting. And it has that nice throwback feel. Dan and I thought this maze contain a mix of the old Slaughterhouse and Inquisition mazes--and maybe a bit of Blood Bayou too. It's a farm, so of course, there are farm animals. These need some plucking still. I was so ready to call this #CockMaze until they brought in the piggies. I guess this is a non-kosher cult. This must be the object of their devotion--Manbearpig!! The animatronic is pretty fantastic. And disgusting looking. Although I need to break away from kayfabe for a moment and commend this actress for a fantastic job as an imprisoned victim. Her expressions and screams were quite convincing. One of the demented family members of the farm stands under another victim. Onto the processing part of the barn. Plenty of body bags here, because of course you need body bags! Better fate than this guy. I appreciate the mix of scenes. This "helpless prisoner" element is something that Universal introduced before Knott's, and it's not bad--except when overused (which is not the case here). Look at all those body parts! Towards the end of the maze, the cult element really starts to make its presence shown. This is definitely more ritualistic than your typical serial killer. This maze also brought the return of the chainsaw to Knott's! Sort of. The chainsaws are real, but they are never powered. Ah well. Jon Cooke's other and truly new maze, located over by Xcelerator at the former site of Black Magic, has been a standout hit this weekend. People who were skeptical that last year's incredible Paranormal Inc. could be topped were pleasantly surprised to see that Shadowlands may very well have done it! First off, Shadowlands incorporates a unique theme that I've never seen used at any haunted attraction, taking on Japanese imagery and mythology to tell the tale of a samurai disappointed by his lack of honorable death. He seems to take matters into his own hands and thus plunges everyone into the realm of the Shadowlands, which takes on elements from Japanese horror and dark lore to create a hauntingly beautiful maze packed full of plenty of scares. Hence, the nickname of #SeppukuMaze. Cooke's mazes have featured plenty of flash and aesthetic brilliance, and this is no exception. But what I appreciated most about Shadowlands was the plethora of designed scares incorporated into the maze. You'll recall that while I was high on the actual mazes of Halloween Horror Nights last week, I couldn't help but notice that all of their scares were of the exact same "boo box" type, with a distraction, then loud sound effect and strobes, and a scareactor popping out of a "hidden" compartment to startle guests. Knott's, on the other hand, features a great variety of scare tactics, and all of them are on display in Shadowlands. Camouflage scares, pop-out scares, distraction scares, animatronics, puppets, fake statue scares... you name it, they're in this maze. And they're blended seamlessly into the theming to create a highly immersive experience. There's even some theatricality in Shadowlands, with a cool scene at the end of a samurai flying around and decapitating enemies. It all adds to a wonderfully creative and incredible experience. Jon Cooke stands in front of yet another masterpiece. Apparently, the entrance portal to the Shadowlands lies over the grave of Wind Jammer. Makes sense. Once inside, guests encounter a preshow. Becuase, of course, you gotta have a preshow in a Jon Cooke maze! But, again, this is good, because it serves to automatically space groups apart. And even between Thursday and Friday, line control was already improving efficiency measures by starting the preshow before everyone had entered, rather than wait for a full group to pack in. Once inside, guests take one of two short routes that are generally similar. This dark forest is ethereal and beautiful... and haunting. I can easily imagine scenes like this being identical in concept art. The visuals are just fantastic. The design and fabrication crew put some great effort into bringing the Japanese-inspired theming to life! Same as above, but from the right. Beware the geisha girls in this maze. They're not going to do anything good for you. This... this is a gruesome scene. The talent popping out are VERY creepy. Beware the surprises of Hag Alley. There are multiple scenes with fantastic theatrical quality in Shadowlands. Inspiration from Japanese horror films is evident. And--something I can appreciate--very photogenic! Moving on, because we don't want to mess with her. Next is a theater house, and I'd like to think that this shot emulates another concept art. The imagery is incredibly striking. A masked figure. Real or fake? Then, we come upon the most alluring part of the maze. Oh wait, yo just want to kill me? Nevermind. We move onto an encounter with a demon creature. Japanese demons are no laughing matter. As you can see, the quality everywhere is astounding. Citizens of Shadowlands, ARE YOU READY FOR A--wait, I already used that joke. But again, the amount of detail in the maze is incredible. The set dressing, the lighting, everything. Cool infinity pit effect here. It's a bro's dream--cuz of all the DRAGONS. But again, detail of this magnitude at a Scary Farm maze was unthinkable a few years ago. It's just a testament to the efforts of the design and build crew. We'll close this out with a scene you've doubtless noticed reoccurs throughout the maze. This year, Knott's Scary Farm did something a little different with their Skeleton Key Rooms and disassociated them from specific mazes. Instead, they are four standalone mini-haunts available only to guests who purchase Fright Lane with Skeleton Key. And while Knott's Fright Lane allows unlimited front of line privileges to the nine regular mazes, the Skeleton Key Rooms are only single admission for an entire night--a move designed to mitigate the low capacity of the rooms. Each Skeleton Key only allows a group of up to six guests to enter at a time, and larger groups will be broken up. That said, I'd recommend that Fright Lane/Skeleton Key holders knock out the Skeleton Key Rooms first thing when they arrive, when lines are lower, vs later, when they can be pretty time consuming, even if they appear to be short. On Thursday and Friday, lines appeared to range from 5-15 minutes on the low end to an hour or hour and a half in the peak of the night. Located just inside the entrance to Camp Snoopy, by the old petting zoo and around the corner from the Grizzly Creek Lodge, Prey sends guests into a small hay maze equipped only with a lantern that can dim and brighten randomly, or go completely out. Guests have 30 seconds before the local hillbilly owners send their swarm of mutant human-animal hybrid monsters to hunt after them. The concept was definitely interesting, and the execution had its pros and cons. The idea works best in a setting that can actually be dark, but the layout is not completely enclosed, which mean that even during moments when the lantern went out, guests dilated pupils could still relatively easily make out where to go. The scares themselves were good tries but nothing special, and at times, the lanterns would switch to a "rave mode" where they strobed in bright white bursts. I'm not sure if this was a glitch or not. Prey proved to be a fun idea, but not necessarily anything super unique. Fortunately, it also was one of the better capacity mazes, which meant shorter lines. The hillbilly actors also provided a fun show, explaining the concept in character and providing entertaining banter. Intentional or not, there seems to be a tribute to the ol' blood-thirsty, messed up hicks of Slaughterhouse in Prey, which is near the site of the old Camps Snoopy maze. Guests who enter find themselves the latest victim of the "Angeldust Killer," who kidnaps victims and turns them into elaborate works of art. This Skeleton Key Room was the second Camp Snoopy location, located near the ferris wheel. The room itself was part theatrical show and part tunnel maze. The lighting effects enabled some dramatic moments, but the second half seemed anti-climactic, with guests emerging to the outside just by progression rather than the result of a part of the story. Although not bad, Slasher didn't feature anything special either. Wait times seemed on par with Prey. Billed as the "Pokemon Go" version of a haunted attraction, Vision utilized augmented reality technology to take guests into the spiritual remnants of the witch trials of Sarah Marshall, who would eventually make sure no one forgot her as the incarnation of the Green Witch who terrorizes Knott's Scary Farm today. Guests entered six at a time into the Green Witch Museum setting and were given devices (smart tablets) that could see into the spiritual world. As the events of the story unfold, spirits manifested in front of them, and a climactic revelation sent the ghost hunters scurrying out. I felt that Visions was the most innovative of the Skeleton Key Rooms, combining a bit of virtual reality with real practical startle scares and effects. And it was also cool to see how other mazes in the park tied into the Green Witch's narrative from a storyline perspective. However, the very low capacity (the operations also require resetting after each group, which eats up another minute or two) meant that this had the longest line out of any Skeleton Key Room. My recommendation: hit this first. The former Haunt Museum turned Town Hall for Ghost Town Alive! is the site of Visions. From a publicity viewpoint, Knott's revealed the least about this Skeleton Key Room--only that it was based on one of Jon Cooke's band mates' fear of Ouija Boards. That was all I had going into the room, but what I found was an entertaining show with some unexpected effects that ended up being my favorite Skeleton Key experience overall. I won't spoil what happens, of course, but I will say that this one is definitely worth going through for Skeleton Key holders. Located on the grave site of the old Windseeker attraction and accessed off Fiesta Village, near the exit of Gunslinger's Grave, Zozo was the last Skeleton Key Room that I was able to experience. Wait times for this seemed to be above Slasher and Prey but less than Visions. Overall, the Skeleton Key Rooms are fun but will probably not blow any veteran haunted attraction visitor away. However, for less experienced haunt fans, they should provide some unique and fun thrills. Divorcing them from the actual mazes seems to have been a good move, since they lower the Fright Lane lines. On the other hand, it seems a bit misleading to advertise 13 haunted attractions for Knott's Scary Farm when 4 of them are upcharges requiring the Fright Lane with Skeleton Key, which not everyone will purchase. That does it for what's new, maze-wise, for Knott's Scary Farm. I think that this line-up may very well Knott's strongest ever--or at least in the time that I've been visiting. I love that the park continues to churn out original ideas and stories and up the production values of the mazes. And despite it being opening weekend, the maze casts seemed to have already rounded into mid-season form. Even the difference between opening night on Thursday and second night on Friday was striking--in a good way. Although these were light evenings overall, and the monsters will face greater challenges once Scary Farm enters its "very crowded" nights, this start was greatly encouraging. Knott's looks like it has a winning season ahead of it. Tomorrow, we'll look at the returning mazes to see how they contribute to this, and later in the week, we'll look at the scare zones and shows as well. In the mean time, make sure to book your visit to the park this season and purchase a Scary Farm season pass if plan to go twice or more. Haunt is off to a great start this year, and I have high expectations it will only get better.